We hear it all the time: more guns means more deaths. Or the opposing and equally hackneyed guns don’t kill people, people kill people. So what is the real relationship? It might seem reasonable that taking guns away should reduce violence and death, but is that true? 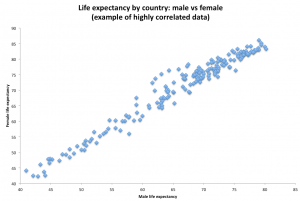 This page looks at the question by presenting the statistics in visual form so you can see for yourself. You can see that there is some relationship, but not a strong as in the previous example. Notice also that on this one we used a logarithmic scale along the bottom of the second chart, instead of a linear one. 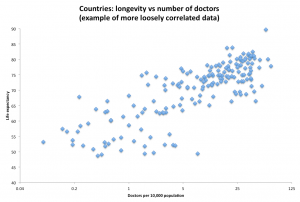 We had to do this because a few countries have a lot more doctors, and this would squish most of the samples onto the left edge if we used a linear scale. It isn’t a trick; it just helps us see the data clearly. Now what about guns? Let’s have a look at those numbers. 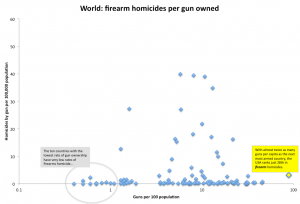 You often hear gun-control people talk about “gun deaths”, meaning people killed using guns. This is almost always a dishonest argument, because what matters is people killed, not what weapon is used. The real question is whether more guns increases murder, plain and simple. The Brady Campaign is one of the main anti-gun lobby groups. They publish a scorecard that ranks American states according to the strictness of their gun laws. We’ll use their ranking as one set of data. For the other set of data we’ll use the FBI’s Uniform Crime Report, the most comprehensive and neutral set of data available. Because the Brady campaign list is a ranking, we’ll rank the states according to homicide rate in the FBI report. Nope. 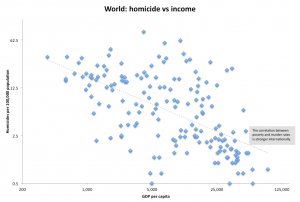 Plotting the Brady ranking against the homicide rate ranking shows no relationship at all. This should come as no surprise to the residents of Oakland, California, a locality with some of the harshest gun control in the nation and one of the highest murder rates. This shouldn’t be that surprising, and we’ll see this again later when we look at the international data. 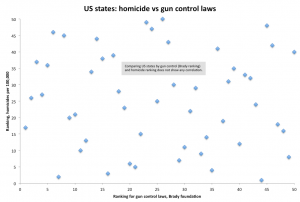 When comparing one country to another, there is no Brady ranking for toughness of gun laws. But statistics for firearm ownership are available. And the United Nations provides statistics on crime that we can use in place of the FBI data. Amazingly, despite the vastly larger number of guns in the US compared to any other country, we rank just 108th worldwide in homicide. 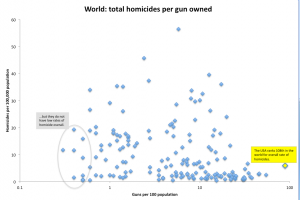 Interestingly, there is still not a whiff of any relationship between gun ownership and homicide. 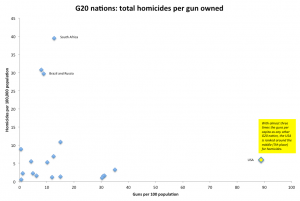 In fact, a half dozen of those G20 countries have the distinction of belonging in the top 20 for gun ownership and the bottom 20 for homicide! If you use the EOCD nations instead of the G20, we rank worse still at #4. But still, this is with vastly more guns than any other country in the list so it’s unclear how guns could be considered the operative factor. As far as Britain or Australia, that is an unrealistic comparison: Britain has always had a very low homicide rate, even before guns were banned there. Australia too has little tradition of homicide, aside from a number of aborigine massacres. 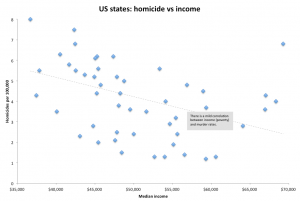 Homicide rates correspond to poverty and social instability, not gun ownership. In the current gun debate, the blame that people place on guns is really unfounded. Dealing with the causes of violence will do good; spending resources to curtail people’s rights will not, and will actually do more harm. You may be thinking that whatever the rates are, they are sure to be helped by taking away guns. Shall we see what effect this has had when it’s been done elsewhere? The ban had no effect on the homicide rate at all. Robbery, including armed robbery, increased sharply for several years after the ban, but has receded again to previous levels. Assault and sexual assault continue to rise steadily both before and since the ban.